A pull up workout is a great, simple exercise routine. Weight training is good, but you can do pull upsright at home (or at the gym) and get a great upper body workout. Here's a sample pull up workout you could do at home with just your pull up bar. As well as some ideas for making the workout harder. Just be sure that you know the correct form for the pull up exercise. Otherwise you might just gut yourself doing this. Here's a simple workout you can do right at home. But just because it's simple, don't think that it's easy. Click here to download the simple pull-up workout. Or, try right-clicking and selecting 'Save As…' to save it to your computer. 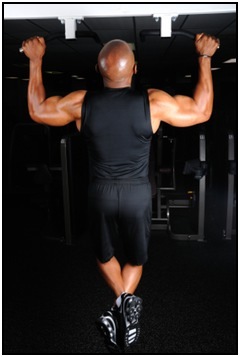 …And here are some other techniques that you can integrate into your pull up workout. Don't use them all together - just know that there are ways to make your workout harder. This little trick is super easy and very effective, and the brain child of Russian strength training guru Pavel Tsatsouline. Basically, put a pull up bar into a doorway of your house (for example, the bathroom doorway) and then do a pull up whenever you go through the door. Or two. Or five. Or whatever. The number isn't really important (though you should keep it small and doable). What you're really going for is training an intense movement regularly. For example, if you can only do seven pull ups, then do five every time you go through that doorway. After a while, it won't seem like so many. And then you do six, and by then seven is easy. Get a backpack that hooks around your waist and wear it when you do pull ups. This will add weight to your workout, and won't put undue strain on your shoulders. This one is fun and very cheap. A thicker bar will help build an awesome grip, but there's just not always one handy. What to do? 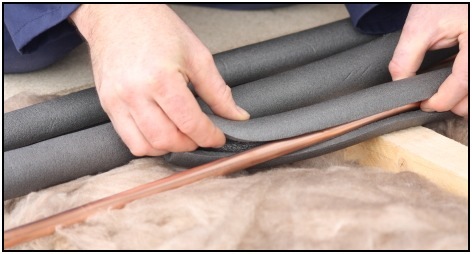 Get pipe insulation at a hardware store for a few dollars. Then duct tape around your bar for your pull up workout and - *voilà* - you have your thicker bar. This is a really easy trick, and builds great hand strength for only a few dollars. Try it. Use negatives if you don't have the strength to do a full pull up. Or if you want to add some weight and something more interesting to your pull up workout. Get a chair under your pull up bar and put on your backpack (if you're adding weight). Then, with your hands on the bar, give yourself a boost with your legs up to the top of the 'pull up position', and then let yourself down slowly. That's one negative repetition. Read the article above on negatives if you're tempted to do them. They allow you to work with much more weight than conventional lifting, and are actually quite safe. Try them out. Pull ups are great, but they're only one of many exercises. You'll want a few other upper body exercises, as well as some good lower body ones for balance (like the ones that are in the sample workout above). Work in some squats, jump squats, or kettlebell swings for your legs. And really think about starting weight training at a gym. The equipment there will make increasing the weight you work with (to build strength) simpler and much safer. Really strive to make your pull up workout a full body workout. It'll be tougher, but you'll build more strength. • Click here to learn more about Workout Exercises and Routines! • Click here to leave 'A Beginners Pull Up Workout PDF and Tips' & go back to the Home-page!